Medications used to treat hypertension and other cardiovascular diseases may sometimes trigger angioedema, a case report of a woman with small bowel angioedema suggests. While rare, the report highlights the importance of recognizing these treatment-related side effects for timely diagnosis and adequate treatment. The case report, “Small bowel angioedema from angiotensin-converting enzyme: Changes on computed tomography,” was published in the journal Radiology Case Reports. Angiotensin-converting enzyme inhibitors (ACEi) are commonly used to treat hypertension and other cardiovascular diseases. One of their known effects is the accumulation of the protein bradykinin, which promotes blood vessel dilation. Bradykinin also increases vessel permeability, which contributes to angioedema. ACEi-related angioedema has been reported in about 0.1 percent to 0.7 percent of patients. Usually, the condition affects the lips, tongue, face, and upper airway, but in rarer cases, it may also affect other body tissues like the bowel. A team at West Virginia University Hospitals presented the case of a 41-year-old woman with small bowel angioedema. She had been referred to the digestive diseases clinic because of a two-year history of sporadic, severe pain affecting mostly the right lower quadrant of the abdominal region. She had a clinical history of hypertension, high lipid levels, and gastroesophageal reflux, for which she was being treated with lisinopril-hydrochlorothiazide, simvastatin, and esomeprazole. Over the course of those two years, she went to the emergency department several times, during which computed tomography (CT) scans of the abdomen and the pelvis, and blood analysis were performed. She had higher than normal white blood cell counts and C-reactive protein levels, two hallmarks of the inflammatory process. Imaging results showed changes to the small bowel suggesting it was inflamed, a condition called enteritis. 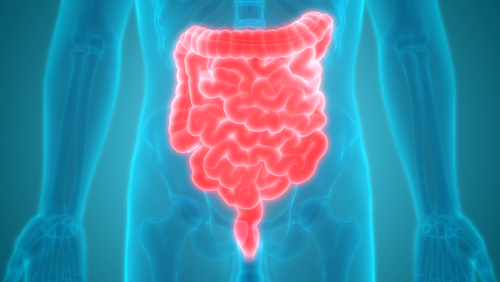 The patient then underwent a colonoscopy, which showed normal tissue with no signs of inflammation, ruling out a diagnosis of inflammatory bowel disease. Because her symptoms persisted, additional testing was performed. Still, her results were all normal, with no signs of infection or tissue abnormality. Analysis of autoantibodies suggestive of autoimmune disease was also negative. In one of her visits to the emergency department, the patient was prescribed daily oral prednisone. While her symptoms improved, she still felt some discomfort. Other medications were tested, but no improvements were reported. Still with no confirmed diagnosis, the research team decided to review her medical chart. They noted that her symptoms appeared just two weeks after she started lisinopril-hydrochlorothiazide treatment, which contains the ACEi Lisinopril. In addition, a CT scan three years earlier showed no signs of an inflamed intestine. Based on these findings, the team decided to stop lisinopril-hydrochlorothiazide treatment. Just two weeks after withdrawing the ACEi, a new CT scan revealed that the small bowel returned to normal, with no signs of enteritis. This result confirmed the diagnosis of ACEi-induced angioedema. She started treatment with Tenormin (atenolol) to manage her hypertension, and no abdominal symptoms were reported during a four-month follow-up period. ACEi-induced intestinal angioedema can be difficult to diagnose, mainly because of the intermittent nature of its symptoms and similarities to other diseases. Researchers believe that “careful review of a patient’s medication list and considering the diagnosis of ACEi-induced angioedema may facilitate a more timely diagnosis.” This may not only reduce associated risks but can also reduce costs and delays in diagnosis, they said. Tagged ACEi, bradykinin, case report, Enteritis, hypertension drug, Intestinal angioedema, Small bowel, treatment adverse effect. In the link below, you’re about to discover an alternative method to quickly and permanently heal your blood pressure. It doesn’t matter what’s the cause of your conditions – be it genetic, high cholesterol, stress, or other factors – the exercises you’re about to learn will help you. What’s more, they . . .